Games, Little Book, Pre- Math, Emergent Reading, Pocket Chart Helper, and More for your Caterpillar to Butterfly Life Cycle Unit. These files were created for Preschool and could also be used for Kindergarten. Games, Little Book, Pre- Math, Emergent Reading, Pocket Chart Helper, and More for your Caterpillar to Butterfly Life Cycle Unit. These files were created for Preschool and could also be used for Kindergarten. Below is a list of each item in the set. 1.) Butterfly Life Cycle Little Book—A six page color and take home and share little book. 2.) 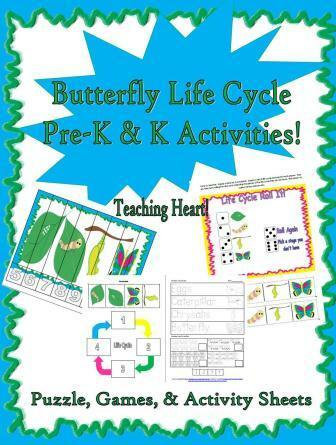 Pocket Chart Pieces—Four large stages of a Butterfly Life Cycle—Eggs, Caterpillar, Chrysalis, and Butterfly. Includes large set of words to match to each stage. 3.) Life Cycle Chart—student cute, and pastes the stages onto a chart. I have included this in color and black and white. 4.) Pre-Reading and Math—Trace the words: Eggs, Caterpillar, Chrysalis, and Butterfly. Trace Numbers, Cut-out, and Glue numbers. 5.) Activity Sheet—Cut and Glue the Next Stage of the Life Cycle. Graph the stages. 6.) Counting using numbers 5-12 Puzzle—Cut the puzzle and students put back together. 7.) Roll a Life Cycle Game—Students take turns rolling dice and collecting a piece of the life cycle based on their rolls. First person to roll and collect all four stages wins. Then they may sequence their stages in order. 8.) Race to Become a Beautiful Butterfly Life Dice Game—Supply 1 dice and a playing marker for each player. Player picks a color line and starts on the leaf. Players take turns rolling the dice. First person to make it to the Butterfly is the winner.